Wee Bunz offers both Chinese and Indian Prefolds. Both will look quite flat when you unpack them, but after a few washings they will “quilt up” - or obtain their familiar fluffiness. Don't be worried if they look too large, prefolds shrink to their intended size as you wash and dry them. 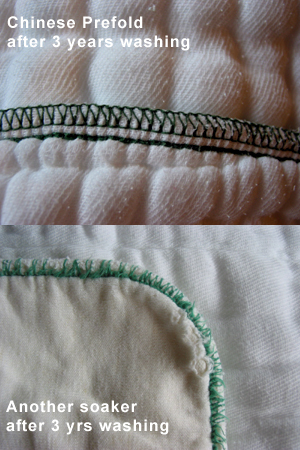 Click on the image to the right for a closer look at what an Infant-sized prefold looks like before and after washing. Chinese prefolds are the most durable. The cotton fibers used to make them are long and robust. These diapers fluff up the most and feel very substantial. The thread used to bind edges is very strong. After three years of constant washing, ours show very little, if any, sign of wear. Click here to see a comparison of a Chinese prefold versus another soaker after three years of laundering - in the same loads of laundry! Indian prefolds are wonderfully soft to the touch. They do not feel as stiff out of the box as Chinese diapers do, and they just keep getting softer with each washing. We cannot guarantee that they will last as long as Chinese prefolds, but we expect them to last through diapering one or two children. The most obvious difference, of course, is their appearance. 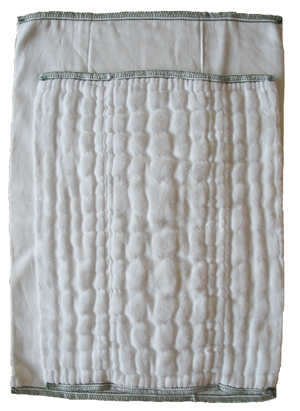 Bleached diapers are bright white whereas unbleached ones are the natural color of cotton fibers and show more variation. 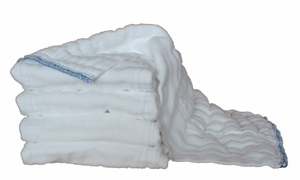 You should also know that unbleached cotton diapers need to be washed more times before they will be ready for use. 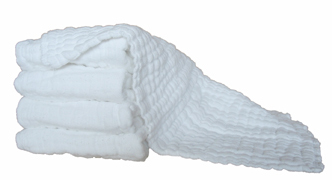 There are natural oils in the cotton fibers that are stripped out of bleached diapers but remain in the unbleached ones. Your unbleached diapers will not reach their true absorbency until the oils are washed out. No, our diapers are not bricks! These numbers refer to the number of layers of cotton fabric you will find on the left, center and right sections of each diaper. Finally, if you ever run out of uses for your prefold diapers, consider donating them to your local animal shelter where they will be greatly appreciated.